Giorgio Vasari: Six Tuscan Poets, detail, 1544. 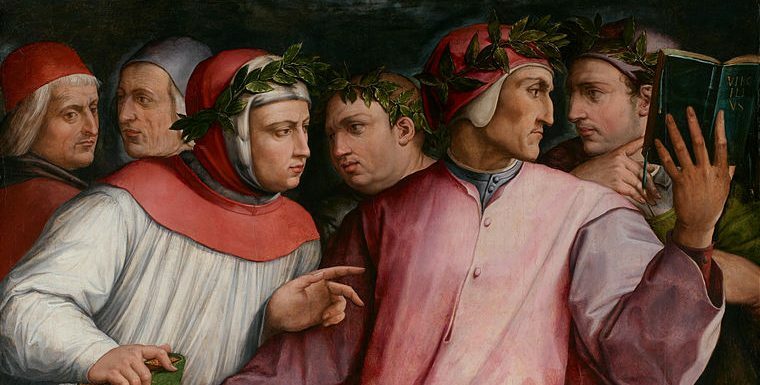 There in the ruins of an ancient Roman Empire, Petrarch accepted his crown of laurels – the first offered a poet in over twelve long centuries. The tradition was all but dead. The age was indeed dark. The slopes of Parnassus were dauntingly steep and deserted. But from somewhere beyond the shroud of gloom that enveloped him, the Muses called to Petrarch and he followed, inspired by the love and the sweet longing of one going home. We allow our great cultural institutions to fall into disrepair and disrepute because, as we strip them of their reverential traditions and their arduous canon, we also strip them of our reasons to cherish them. We call them before the tribunal of public opinion to justify their very existence, as if we can no longer see through the smog to the heights of Parnassus, lonelier than ever because we have forgotten that it is even there. We attempt to chain the Muses to the machinery of our modern malaise, as if we do not remember that they exist to show us the way to transcend that malaise, to find our way home again, by way of that steep and difficult climb, to the bosom of art and learning. It is easy for us to imagine that someday our symphony halls will be ancient ruins and the source of a painful longing for those who remember the wasted Muses, or who sift through the rubble for what was lost. We can even hear the howls of those who proclaim that it should be so, and we mourn the actions of those who obviously believe it. Yet, there are many more of us who recognize Virgil’s description of a deep and ardent desire because it urges us, too, to persevere against all difficulties in the name of the symphony orchestra. 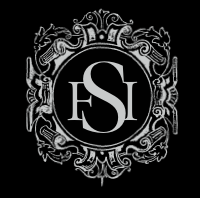 This is the mission and the purpose of the Future Symphony Institute: to orchestrate a new renaissance for live classical music, to ensure that the dawn breaks on symphony halls that rise like polished temples in our midst rather than like ruins on abandoned hilltops. To circumscribe this immense task, we created seven initiatives that describe and focus our efforts. The first two are of a philosophical nature. We must, firstly and perhaps most fundamentally, reframe the way we understand and communicate what is being overlooked because it is immeasurable and immaterial – namely, the principle value of the symphony orchestra to society. By doing so, we not only orient our institutions with respect to mighty Parnassus and the dawn of a new renaissance, but we also arm them with an answer for the cynical tribunals who mercilessly impugn their relevance and their mission. Our second initiative focuses on the critical role of the orchestra as an educator – not just musically and not just of children, but in the way that high culture has always been that which teaches us what it most profoundly means to be human. We must build the foundation for and design the structure of this meaningful role for the orchestra – so critical and inspiring in an age that is increasingly digital and impersonal. Some of our goals will require extensive and scholarly research. This will certainly be the case for each of the following three initiatives. Most immediately, orchestras need a concrete system by which to understand and quantify their audiences – one that goes beyond the limits of their usual and failing marketing methods. They must learn to identify their patrons not as demographic statistics but as human beings driven by internal aspirations and motivations that do not necessarily correlate to physical characteristics. They must find the real reasons people come to love the symphony, why they feel the sweet longing that urges them to our concert halls. The field of psychographics presents us with a way to understand and measure these drives – a more meaningful way for orchestras to relate to and reach their audiences, both actual and potential. Secondly, with a proper psychographic system and the research that supports it, we can construct a bridge between casual attendance and eventual connoisseurship. Much energy today is wasted on efforts to bring the uninitiated into the audience – wasted because there is no effective plan to make the uninitiated into the convert. And this is far from the only case of mislaid efforts. We must take the time to thoroughly and critically evaluate the oft-repeated theories and measures that have neither adequately explained nor delivered orchestras from their troubles. Much of the dogma that assails our orchestral institutions – and informs their failing policies – has not been tested by scholarly research, and doing so is our next critical initiative. Finally, if our first two initiatives are entirely theoretical, our last two are purely practical. To begin with, it is essential that we develop a new architecture for our symphony halls – specifically, one that emphasizes the relevance of the symphony orchestra to its community. The trend of late is to erect halls that, frankly, resemble something from another planet; and when we look upon them, we feel a predictable sense of estrangement – a hesitance to approach what we have difficulty recognizing as human. The new halls must remedy this error and present themselves as neighbors and friends, both outside and inside where the offering of hospitality must equal the expectations of today’s cultural consumer. But among the most challenging of our tasks is the initiative we list last here: the development of a blueprint for future union policies and relations. In today’s business climate it is becoming increasingly clear that unions must understand their stake and their opportunity in shaping change before it is forced upon them. Change is as enduring a feature of society as is our need for traditions that endure change – indeed, that transcend and transform it. And over his shoulder we see our vision. We, too, are urged by a sweet longing that will not be deterred by the challenges or the times that face us. In our sights are the heights of Parnassus, and the dawn of a new renaissance. The fulfillment of both the youthful glory and the incandescent future of the symphony orchestra, the new renaissance is, like the one so long ago, the birth of a present more glorious than what came before it, but entirely dependent upon its rich and heroic past. And posterity will reap the bounteous and beautiful rewards. * “But a sweet longing urges me upward over the lonely slopes of Parnassus” (Georgics III, 291-292). Mount Parnassus, rising above Delphi in Greece, was the home of the Muses of Greek mythology, and in literary references it symbolizes the source of art, literature, and learning. It derives from the same root as the ancient Trojan word for a house. † From Petrarch’s Coronation Oration, translated in Ernest Hatch Wilkins, Studies in the Life and Works of Petrarch, Cambridge, MA: Medieval Academy, 1955. ‡ Petrarch, in a letter to Lapo da Casiglionchio, 1355, translated in Richard M Gamble, The Great Tradition: Classical reading on what it means to be an educated human being, Wilmington, DE: ISI Books, 2009. § From Petrarch’s Coronation Oration, translated in Ernest Hatch Wilkins, Studies in the Life and Works of Petrarch, Cambridge, MA: Medieval Academy, 1955. Imagine if each and every one of us who are deeply engrossed in the magnificence of Orchestral music were to leave behind at least one replacement who carries on the passion and commitment into a next generation. Unfortunately, I believe that I have failed to do so and wonder dispiritedly what went wrong. Maybe reading this website will open-up some possibilities. This is a wonderful site. I’m seeking to reintroduce the sacred feeling into music, in a tonal way. I suggest Sir Roger Scruton, however, can be occasionally self-righteous regarding pop music. I love Metallica and Nirvana, for example, though I am ever drawn to Bach’s cantatas and Beethoven. Music does develop, otherwise it becomes mere pedantry. Wonderful website and I admire Sir Roger. For an example of how I wish I could make composition sound in a modern context is the Grosse Fuge, Cavatina and BWV 66. They say it all for me unless there is something more that ccan be said.